Rabies is a preventable viral disease of mammals most often spread through infected saliva from wild animals by a bite or scratch. The most common carriers of rabies are skunks, bats, raccoons, coyotes, but all mammals are susceptible to infections, including both you and your pets. Be cautious of animals that exhibit signs of rabies, such as disorientation, fearfulness, aggressiveness, excessive drooling, or difficulty swallowing. Generally, a lack of fear of humans is also unusual behavior for wild animals. Report stray or ill animals to animal control by calling 303.438.6400 and protect your pets and livestock by keeping rabies vaccinations up-to-date. Protect Yourself, Your Pet, and Your Community. . . . . . . . . . . . . . . . . . . . . . . . .
Visit your veterinarian with your pet on a regular basis and keep rabies vaccinations up-to-date for all cats, ferrets, dogs, horses, and livestock. Avoid contact with any wild animals, especially any that act unusual. A healthy wild animal will generally avoid human contact. Maintain control of your pets by keeping cats and ferrets indoors and keeping dogs under direct supervision and on a leash. Observe wild animals from a distance. Never feed or handle unfamiliar animals or wildlife even if they appear friendly. Avoid leaving food or garbage outside as it often attracts stray dogs, cats, and wildlife to your yard. Report any wild animal acting strangely to Broomfield Animal Control at 303.438.6400. Contact your veterinarian if your dog, cat, or ferret is bitten or scratched by a wild animal. Seek immediate medical attention if you are bitten or scratched by an animal, or had any contact with a wild animal, then contact Broomfield Public Health at 720.887.2220. Rabies post-exposure vaccinations may be needed immediately to prevent the development of rabies. Healthy Pet Resources. . . . . . . . . . . . . . . . . . . . . . . . . . . . . . . . . . . . . . . . . . . . . . . . . 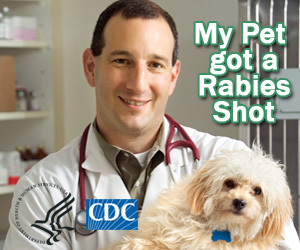 Contact your local veterinarian for wellness care and rabies vaccination.